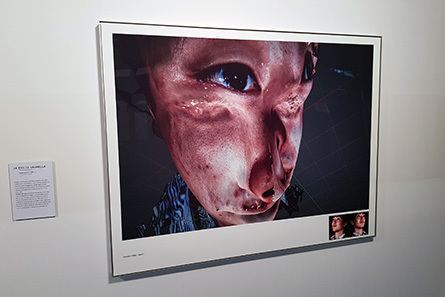 The Wallonia-Brussels Federation’s stand exhibits French artist Pierre Jean Giloux’s photographic and movie creations in the Art Brussels’ contemporary art fair area dedicated to emerging galleries. This is where one of the artist’s “Invisible Cities”, from 2015, is crossed over by an enigmatic object. It has the shape and the slowness of the blimp which flies over Miami displaying the message “The world is yours” in Scarface. This message is still uncertain fifty years after this spring that we hardly forget. The city that Giloux shows us is Japanese; the polygons of the object that inhabit it recalls machine computation. Its apparent facets are the ones which betray its true origin. This elliptic volume exists in this world, in Tokyo. 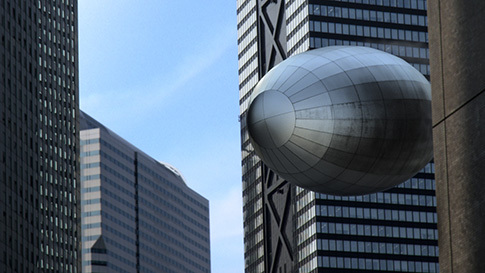 It is called “Egg of Wind” and has been placed as a riddle at the foot of concrete towers by architect Toyo Ito. We shall mention that this architect was strongly inspired by the 1960s’ Archigram group which is the source of the utopian urban concept of “Walking City”. Is it not our collective renunciation to passed utopias which haunt the megalopolis that is presented here? On the second floor of the Wiels Contemporary Art Centre, there are repeated sounds that, inexorably, lure us to the room of the “Black Chords” (2006) installation of the Paroles exhibition, from another French artist: Saadan Afif. He has placed thirteen Les Paul electric guitars which are connected to as many Epiphone amplifiers. But there are no guitar players; here the audience walks through the instruments that the artist automated with some mechanisms activating them from time to time. The guitars are tuned in different ways and the slowness of it, which is due to a program, evokes a concert that will never truly start. It is thereby useless to try to grasp the mechanisms that activate surreptitiously. But in the pit of a rehearsing orchestra, would we be able to get where the sounds come from? We give in to this music of which the mood seems to be coming straight from a David Lynch movie. 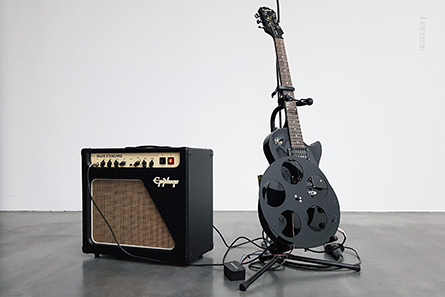 Roundness emerges from the repetition of the six sounds produced by the autonomous guitars. We take pleasure in imagining them without any audience, playing the notes from the sheet music that connect them one to another to alternatively shed “long tears” that reach a “monotonous languor”. During Art Brussels, Centrale For Contemporary Art presents eleven collections, among them the Vanhaerents one where we discover the video installation “Self portrait as a fountain” (2000) from American artist Paul Pfeiffer. It is a tribute to tributes if we consider Bruce Nauman’s eponymous photograph, dating from the end of the 1960s. Marcel Duchamp is evoked regarding the title of his iconic work, “Fontaine”. But it is particularly a tribute to Alfred Hitchcock. 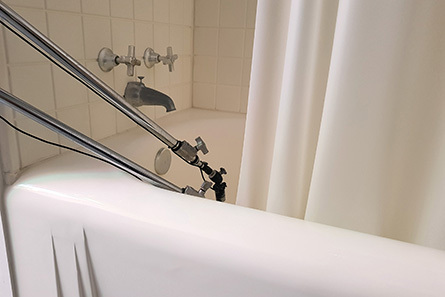 Indeed, we immediately recognize the scenery of the shower scene in the movie “Psycho” of 1960. Water runs and only the actress is missing while the booms, along with the movie cameras, take again the director’s points of view so that a screen broadcasts them successively and in real time, close to reconstitution. We are reminded of our astonishment when, at the end of the previous century, we felt spied on from all sides without really knowing whether or not this extreme surveillance should be reassuring. We managed to get used of the surveillance until it took other forms and where we actively took part in with social media. In the impatient waiting of the interconnection of our bathrooms, final intimacy entrenchment, so that together we make the world a better place! Manuel Abendroth and Els Vermang, of the LAB[au] trio, initiated the platform where they present the Earth & Sky exhibition in the former Brussels Société d’Électricité. The idea is to “question the way technologies influence our landscape”. There, we discover pictures of what seem like documentary photography by Jon Rafman. The body lying on the floor, covered with a sheet reminds us of Weegee’s photographs which, as early as the 1930s, used to listen to police radio frequencies to be the first to capture crime scenes. However, John Rafman does not need to hurry towards the site of an accident because the Google cars travel the world and are everywhere to document it without any judgment. The interest of the “Earth & Sky” exhibition is that it emerges from the dialogue between works and from practices getting closer. Thus, alongside the images captured in the Nine Eyes series, initiated in 2008 by collecting singular images on Street View, there was Ed Rusha’s book which in 1996, photographed each and every building on Sunset Strip, one after the other, from the back of his pick-up. For Rusha, just as Rafman, it is by delegating the shootings which constitute the series. It goes from the ultra-ordinary for one, to the extraordinary for the other. Let us stay for some time at the Société d’Électricité where another installation also uses a Google service, or hacks it in the context of art. The platform this time is Google Earth. Dating back to 2014, the work is entitled “The Universal Texture recreated”. 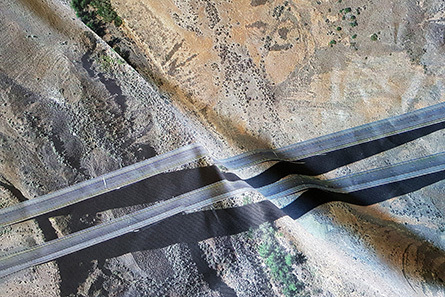 Clement Valla, artist who since 2010 has been collecting satellite views that the American company is not able to depict without some mistakes, stages the accident. He has, as usual, extracted a satellite view from the Internet to recontextualize it in the exhibition space. Printed on canvas, it covers what could be a misassembled table. This way, an accident emerges in the landscape. Thus, it replaces the Google apparatus in its inability to represent roads and other infrastructures without liquefying them when they cross valleys or rivers. The images from the series that has made the artist internationally known are presented, appropriately, as many “Postacards from Google Earth” on a rotary display stand. 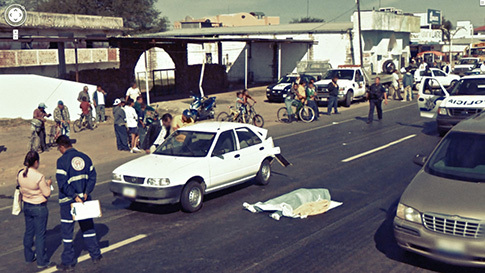 A dialogue is established between a triggered accident and some simulated accidents. Here, the human is as good as the machine when it comes to creating strangeness in a depicted landscape. While iMAL is currently under renovation, Yves Bernard hosts the #Layers exhibition in the Raffinerie. The exhibition is organized by Italian curator Fabio Paris, co-founder with Lucio Chiappa and Domenico Quaranta of Link Art Center. Digital is at the center of gathered practices or uses. Indeed, according to the curator, the title of the exhibition “refers to the different ways in which digital complexity manifests itself in the works presented”. This is the case of Emilio Vavarella’s “The Digital Skin Series” (2016) print. There is another sort of collision between what is flat and what is not. The flatness being the photographs of ordinary people’s faces that the artist met, while the volume on which these faces are put is the artist’s virtual skull. A monstrous form emerges from these collisions or mappings, in a time when face transplants have become banal, and when we are even considering head, or rather full body transplants, considering that the place of self-being is the brain. What the artist’s representations have in common with surgical practices is questioning the notion of identity when transhumanism even goes as far as expecting to emancipate the mind from its body! It must be accepted that in the past decades, we have been leaving our knowledge on data centers before delegating our reasoning to artificial intelligences. What will we do when we have finally replaced our useless limbs with robotic arms? The answer provided in the #Layers exhibition by Guido Segni is somewhat radical: nothing, absolutely nothing. 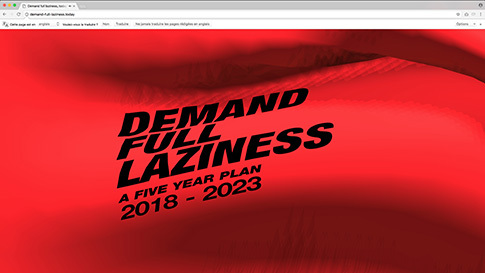 We will finally give ourselves over to laziness as in the title of the long term project “Demand full laziness, today. A five-year plan for the dull automation of art production”, initiated this year. This other Italian artist started by programming the machine, which is to improve by itself as is the case in deep learning, so that it can create in his place. This machine is programmed to depict the portrait of the luxuriating artist. Since there has to be an economic model in every project, we have the possibility to produce it collectively through the patreon.com crowd-funding platform. Isn’t it the ultimate dream, considering the success of gambling, to be paid without having to give anything in return? The Finnish government must try universal income! Finally, let us end our journey with Argentinian artist Flavia Da Rin’s solo show, which collector Thierry Tilquin organized in his exhibition space named Senne. The essential of the works presented dates from the mid 2000s. It is about an important detail. They announce both the selfie trend and the Snapchat effects: specifically the one magnifying our eyes. But facing these many self-portraits with “make-up” pixels, we inevitably think of Cindy Sherman, who never stops changing in front of the camera. 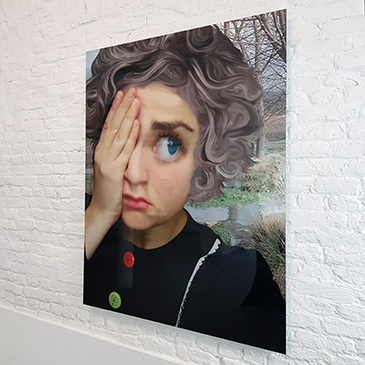 Flavia Da Rin’s work may be considered as a fundamental step between the stories that used to being told by Cindy Sherman and those, more recent and widely broadcasted on Instagram, by Amalia Ulman. Art history is made up of stages, in this case going from transformation to modification, up to sharing. Thus, digital irremediably contaminated the artists’ practices, but also curators and other critics, up to collectors and institutions. Written by Dominique Moulon for TK-21 and translated by Garance Moulon, April 2018.